1 Leaving is not always easy but it has to be done sometimes. We wish you lots of success on your further way. 4 We wish you lots of success on your way. Sadly we will not go this way together. 5 Sometimes you have got to look out for new aims and challenges. May all you reach all your aims. 6 You were always a competent and valuable employee. We are very sad about you leaving our company and hope that our ways will cross again. 7 We know that you have to take this step for your personal development but still it leaves us sad. 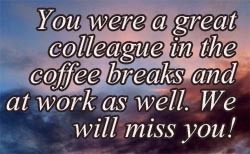 We will miss you as a colleague.